19 May 2016. The African Postharvest Losses Information System or ‘APHLIS’ is a scientific model producing calculated estimates of postharvest losses of food crops across sub-Saharan Africa. It was developed in 2010 by NRI, the European Commission’s Joint Research Centre (JRC) and information specialists ISICAD (Information Systems for International Cooperation in Agricultural Research and Rural Development) and is based on the work and expertise of Rick Hodges, NRI’s Visiting Professor of Grain Postharvest Management. 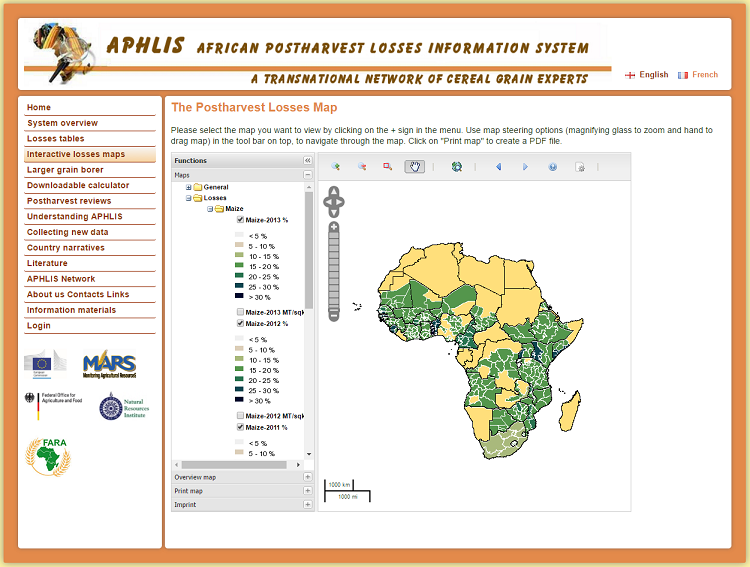 APHLIS combines scientific data from literature on postharvest loss with local factors from a network of over 35 African postharvest experts to generate localised estimates of losses. Such local factors include weather conditions, pests, grain drying conditions and the length of farm storage periods, among others. The combined information is fed through an algorithm which produces percentages loss at each link of the value chain – for example, at harvest, during threshing or storage – and is modified according to the factors for localised estimates. All data is freely available on the APHLIS website, primarily as maps, where users can zoom in to details at a regional level, download the information as tables or pinpoint the specific scientific papers that were used to calculate the estimates. The experts that make up the network also act as APHLIS champions; they are currently expanding their reach with a new and improved version of the information system, through a 5-year project called ‘APHLIS+’ (Aphlis plus). The core project team is led by NRI’s Bruno Tran, together with Tanya Stathers, Ben Bennett and Jan Priebe, Marc Bernard (AfricaRice), Felix Rembold (JRC), Brighton Mvumi (University of Zimbabwe), and Frank Sonntag and Rudolf Böck (AKM-Services). 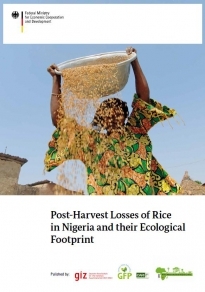 The study ‘Post-Harvest Losses of Rice in Nigeria and their Ecological Footprint’ presents an analysis of food losses in the harvesting, processing and marketing stages in Nigeria, and identifies their ecological footprint. Commissioned by the Deutsche Gesellschaft für Internationale Zusammenarbeit (GIZ) on behalf of the German Federal Ministry for Economic Cooperation and development (BMZ), special unit “One World – No Hunger”, it has been written by Dr Adegboyega Eyitayo Oguntade, Department of Agricultural & Resource Economics, Federal University of Technology, Akure, Nigeria; Daniel Thylmann, and Dr Sabine Deimling, PE INTERNATIONAL AG, Leinfelden-Echterdingen, Germany. According to the study, the main hotspots for post-harvest losses are harvesting and parboiling followed by losses occurring during milling. The final results show an estimated post-harvest loss of 24.9 per cent, resulting in a substantial loss of revenue for farmers. Considering the entire global warming potential along the complete rice value chain a large environmental footprint can be seen: the losses in the rice value chain account for the emissions of around 0.65 million tonnes of CO2eq. into the atmosphere. The industrial value chain shows 20 per cent lower global warming potential than the traditional value chain, due to lower losses along the value chain.